This photo was taken of Gord and I by our lovely neighbours (Vince and Anita) in the next door stateroom on our cruise. 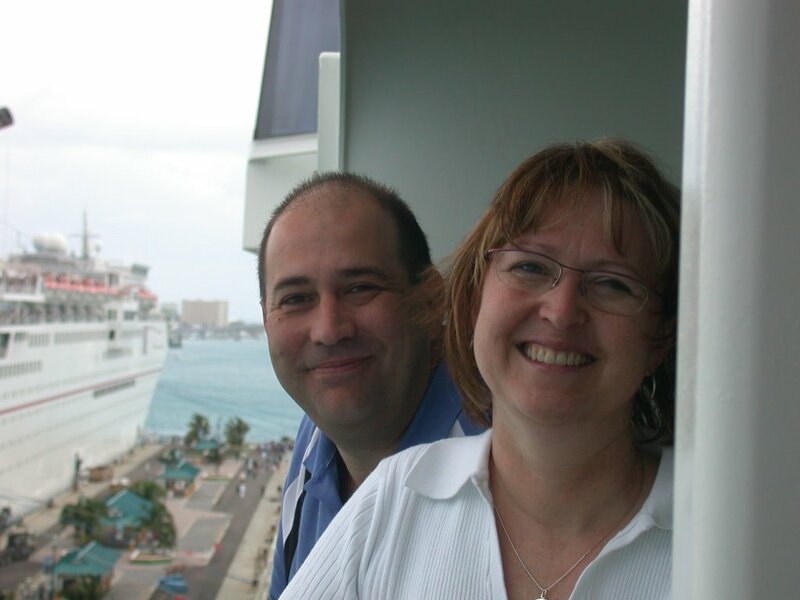 The photo is of Gord and I on our balcony, we were waiting to go ashore on St. Thomas, US Virgin Islands. We had a great time on our cruise, despite that fact that we had a few days of poor weather and also a couple of very rough sea days.... even so, the ship was beautiful, the islands too, it was relaxing and re-energizing all at once. We visited Puerto Rico, Antigua, St. Thomas and Bahamas..... turns out we LOVE cruising as a vacation and I only wish we had another one booked to look forward to! I am feeling very well, I had no real restrictions (apart from getting extra sleep), and I enjoyed the entire vacation. Medically, a bit of news... 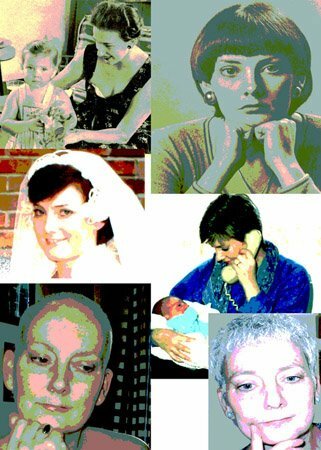 I finally have a Saskatchewan oncologist, and will see him January 19. The CT scans were unfortunately dissappointing, as I was hoping for further shrinkage of the tumors, but this did not happen. However, there are no new spots, and it is hard to tell if I am stable, based on the last CT scan. So, the plan is to rescan in 8-12 weeks (I chose 8) and that will tell us what we need to do next. So, I am still on "chemo-vacation" over Christmas, and I am VERY grateful for that. Thanks for the update. Great to hear that you had a fantastic time on the cruise. You and Gord look very relaxed in the photo. I am looking forward to hearing all about it next week. Good news that you finally have a local oncologist. Hopefully that will make communication easier. We are all looking forward to christmas. Glad you enjoyed the cruise, and was the food fantastic? Glad to hear you get a break over Christmas. We will see you in Regina. Take care. Tried to call you and then found out thru the grapevine that you were off on your cruise and New York , glad you were feeling well so you could enjoy it all. The kids were reading the blog and are amazed at how much everyone has changed. TAke Care I'll call you. Hi Joanne and all, That is a great picture - cruising certainly seems to agree with you two as I remember a great picture from the last one! It's so good to hear that you enjoyed your vacation and that your "chemo-vacation" will continue over the holiday season. I'm sure you are all getting excited about Michelle and Craig coming home and the Condon gang gathering together. It'll be fun! Merry Christmas! HI Joanne, I am so thrilled to hear that you had a wonderful time in NY. Did you enjoy Wicked? Also did you go to China Town? The picture of Gord and you on the cruise looks great. I am so pleased to hear that you had a wonderful time and now you can enjoy xmas with all of your family. I hope that you have a restful and fun holiday season and I will give you a call soon. It is a lovely picture. Hope Christmas goes well and that you keep getting stronger on your chemo break. Think of you often and I must say I really have admired your fortitude over the past few years...and the sewer...why,why,why. So nice to hear you and Gord had a great vacation. Thanks dear for sharing this informative blog with us. It has fresh and unique content that can help users better understand about cruise parties. I also find a site Sydney Harbour Cruises where they are giving special offer on Christmas Cruise party. Just book 2 ticket and get 1 ticket for free of cost. Hurry up! Offer Limited!